Independent surveys show that Brown students are among the happiest in the nation—and there are some very good reasons for that. Its warm and welcoming community embraces diversity and frees you to be your best self. Brown awakens new possibilities through opportunities to participate in global issues … or to focus on a specific interest in one of their many student groups. Brown also offers the quintessential college experience as students cheer for their favorite athletic teams and savor the vibrant City of Providence. The iconic Van Wickle Gates on the Quiet Green open only twice per year: inward for Convocation, when first-year students walk in and are welcomed by a gathering of the Brown community, and outward for Commencement, when graduating seniors process out past alums, family, friends and others. According to superstition, any Brown student who passes through the gates more than these two times will be cursed with bad luck. Each year since 1960, students crowd onto the College Green for Spring Weekend Concerts, sponsored by the student-run Brown Concert Agency. Historical acts include Ray Charles, Bob Dylan, Bruce Springsteen, U2, and R.E.M. Among more recent performers are The Shins, Wilco, the Roots, The Flaming Lips, M.I.A., Nas, Of Montreal, MGMT, and Snoop Dogg. Brown students are curious and engaged; active involvement outside the classroom is central to Brown’s culture. Brown’s close-knit community is reflected in its housing and dining systems. Students live in residence halls arranged on scenic, grassy quads and courtyards. Not to mention one of Brown’s most valuable assets: the City of Providence. Its many galleries, shops, and restaurants supply convenience, enrichment, and entertainment. Thayer Street, which runs through the center of campus, is always buzzing with activity. So, meet friends for dinner at the Ratty before improv rehearsal and a night of studying at the Rock for that macroeconomics exam. Spend Sunday afternoon reading in the shade of a huge tree on Lincoln Field, or see a movie at Providence Place Mall. Play Frisbee on the College Green before heading to your neuroscience review session, and then enjoy a cappella beneath Wayland Arch. It’s all part of the Brown experience. Bruno the Bear, as the mascot of Brown University, had its beginning when Theodore Francis Green 1887, a member of the building committee for Rockefeller Hall, placed the head of a real Brown bear above the arch that was the central feature of the trophy room in time for the opening of the new student union in January 1904. After he mounted the bear head, the powerful symbol gained wide support. Drawings of bears began to grace the pages of the Liber Brunensis, and the bear had gained acceptance as a mascot. Brown is an independent, coeducational Ivy League institution comprising undergraduate and graduate programs, plus the Alpert Medical School, School of Public Health, School of Engineering, and the School of Professional Studies. The College offers 80 concentration programs that lead to the bachelor of arts or the bachelor of science degree. Brown’s vibrant, diverse community consists of about 6,200 undergraduates, 2,000 graduate students, 490 medical school students, more than 5,000 summer, visiting, and online students, and over 700 faculty members. Brown students come from all 50 states and more than 115 countries. 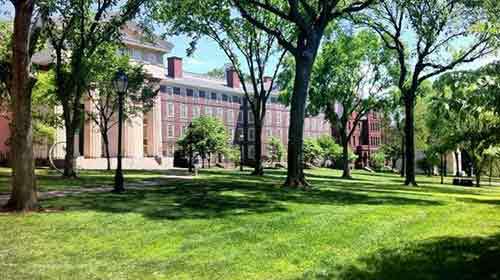 Brown University was originally named “The College in the English Colony of Rhode Island and Providence Plantations”, but was renamed after Nicholas Brown donated $5,000 to the school in 1804 when tuition was only $5. Brown has the oldest undergraduate engineering program out of all of the Ivy League schools. The first chancellor of the university was Stephen Hopkins, who was the chief justice and governor of Rhode Island, and was also one of the original signers of the Declaration of Independence. (born April 15, 1990) was born in Paris, France, but raised in England. The actress got her breakthrough role as a child in the hugely successful Harry Potter film franchise. Watson grew up on camera as she reprised her role as one of Harry Potter’s best friends, Hermione Granger, throughout the entire course of the film series. After committing to the Harry Potter series for a decade, Watson has transitioned into a popular adult model and actress, having appeared in the popular films The Perks of Being a Wallflower and My Week with Marilyn. (born October 20, 1979) graduated from Brown University in 2001. He then struggled to make it as an actor in New York City, where got parts on such shows as Law & Order: Criminal Intent and CSI. Krasinski also had a bit part in the 2004 film Kinsey. The following year, he began his star-making run as Jim Halpert on the popular sitcom The Office. Krasinski landed substantial roles on the big screen around this time as well, starring in License to Wed(2007) and Leatherheads (2008). He has directed two films—2009’s Brief Interviews with Hideous Men and the upcoming 2015 dramatic comedy The Hollars.